First blood to the RAF. Monday 16th October, 1939 2.30pm it’s a quiet Autumn afternoon over the Lothians, the Second World War was in it’s infancy, Scotland was still untouched by the carnage that had already seen Poland fall to Nazi Germany. This was about to change, a flight of 9 German Junkers 88 bombers flew out from their base at Sylt on the northern most tip of German and headed over the North Sea and towards their target, the Royal Navy on the Firth of Forth. The bombers somehow managed to evade detection, and they were only spotted as they flew up the river. An anti-aircraft battery was drilling with practice rounds and hastily reloaded with live ammunition. Their firing alerted other units and ships along the estuary. The Luftwaffe were to sink HMS Hood if she was at anchor in the river. As it turns out she was not, several ships were in dock but the bombers were under strict instructions not to bomb them at anchor in dock to avoid civilian casualties. 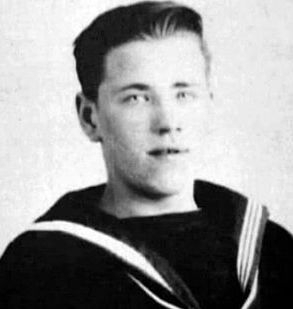 Instead they turned their attention to the ships lying at anchor including the Cruiser HMS Southampton and the Tribal class destroyer HMS Mohawk, who’s crew included Dalkeith man ,Able Seamen Jock Kerr. I had the pleasure of meeting Jock in the late 70’s when we worked at Rowntree’s in Edinburgh. They were totally unprepared and the first warning of attack came as lookouts sounded the ‘Action Stations’ alarm. All hands scrambled to their positions, Jock made his way to B gun deck, the upper deck and to his horror saw a Ju88 bearing down on the ship, bomb doors open, ready to attack. 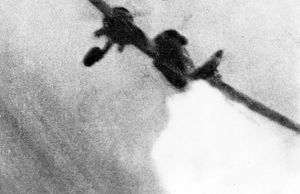 The German aircraft dropped two bombs, Jock recalled in later life that he could still see them “clear as day” , big and black,falling through the air and striking the water either side of the ship. Although they did not hit the ship they showered her with huge chunks of shrapnel and caused terrible casualties, 16 men were killed and 44 wounded. Jock looked down from his position and described is as “horrible, there was blood and guts everywhere.” He remained very critical of the lack of warning about the attack to his dying day and felt they could have fought off the attack with adequate warning. 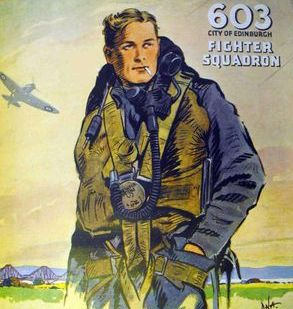 Their job done and now under heavy fire the Germans turned for home but got separated, 602 City of Glasgow Squadron was already in the air, and 603 City of Edinburgh Squadron (below) were scrambled to intercept them. Both Squadrons were Auxiliaries (Reservists) and equipped with brand new Spitfires, they were desperate to engage the enemy and put them to the test. Barely in the air 603’s Spitfires bounced three Ju88s at 4000 feet scattering them in all directions, the Spitfires latched on to one of the aircraft and chased it inland, reports from the Dalkeith Advertiser of the time describe how they arrived over Bonnyrigg without warning, (no sirens had sounded) the peace was shattered by the roar of engines and a blast of machine gun fire from the pursuing Spitfires sending spent cartridges down on to Bonnyrigg High Street. The Ju88 weaved and turned it’s way back towards the coastline in an attempt to shake off the Spitfires, but to no avail. Taking it in turns to attack they poured hundreds of .303 rounds into her unit Pilot Officer Pat Gifford administered the ‘coup de grace’. 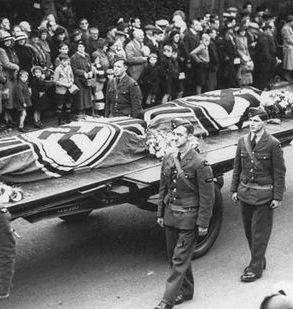 The German bomber plunged towards the sea about 4 miles from Port Seton, a local fishing boat saw it go in and picked up the survivors. Pat Gifford is officially credited with shooting down the first enemy aircraft in WW2 in UK airspace but it was a close run thing. 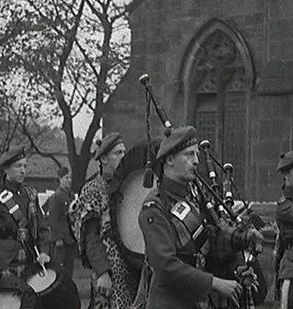 602 City of Glasgow Squadron engaged the Germans at much the same time and attacked them over Fife. 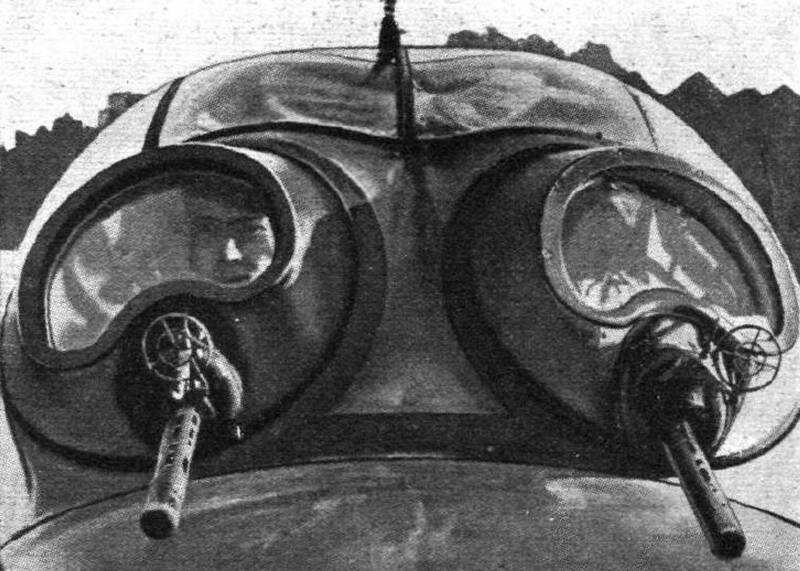 Flt Lt George Pinkerton and Archie McKellar pounced on the Ju88 piloted by Hauptmann Helmut Pohle, he was at a grave disadvantage, during his diving attack on the ships at anchor, he had lost his canopy, leaving the crew exposed to the elements. 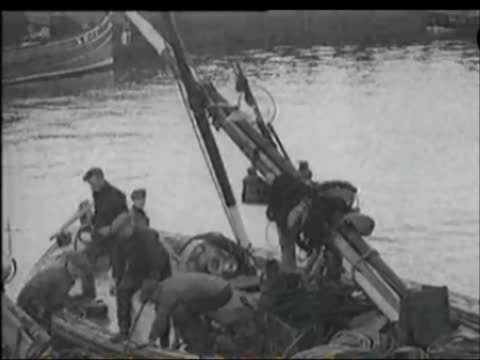 Attack after attack came in until Pohle lost control, crashing into the sea off Crail, almost hitting a small ship. Pohle was the only survivor, the other three crew were killed. To this day 602 and 603 Squadrons maintain a healthy rivalry as to who shot down the first German. Pat Gifford was shot down and killed during the Battle of France in 1940. The surviving Germans were taken to Edinburgh Castle until they recovered from their wounds, then sent to a POW camp. 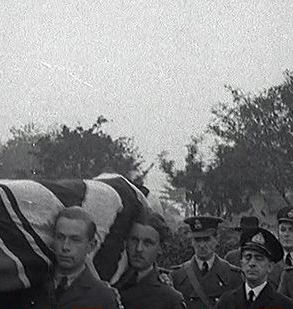 Their crewmates were buried with full military honours in Joppa Cemetery, Edinburgh, they were re-interned post war in the German Military Cemetery at Cannock Chase, England.